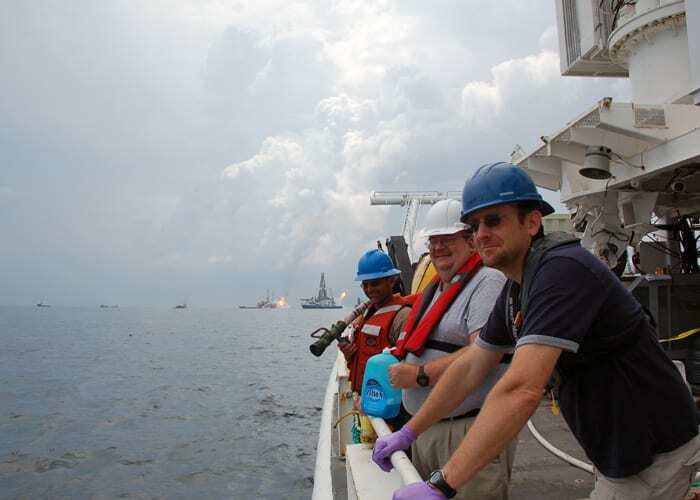 Did oil-eating microbes deplete oxygen in the Gulf of Mexico? 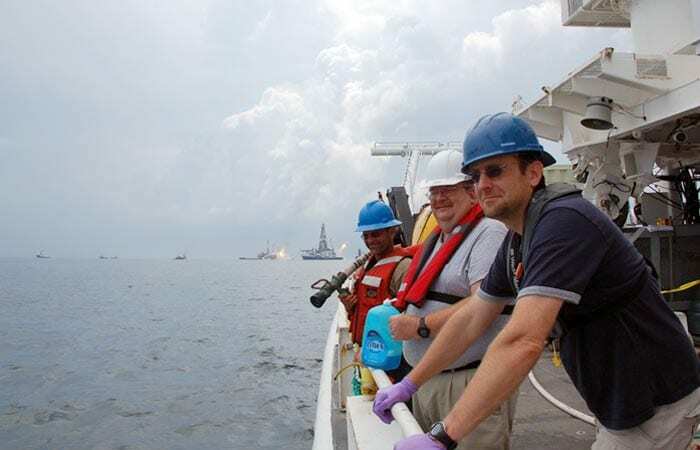 In the scramble to get to the Gulf of Mexico to study the Deepwater Horizon oil spill, Ben Van Mooy found out firsthand why the National Science Foundation called its emergency research funds “Rapid Response” grants. Within two weeks of writing his proposal to do research on the spill, Van Mooy was at sea in the Gulf. Van Mooy’s key question was: Were microbes eating the oil? 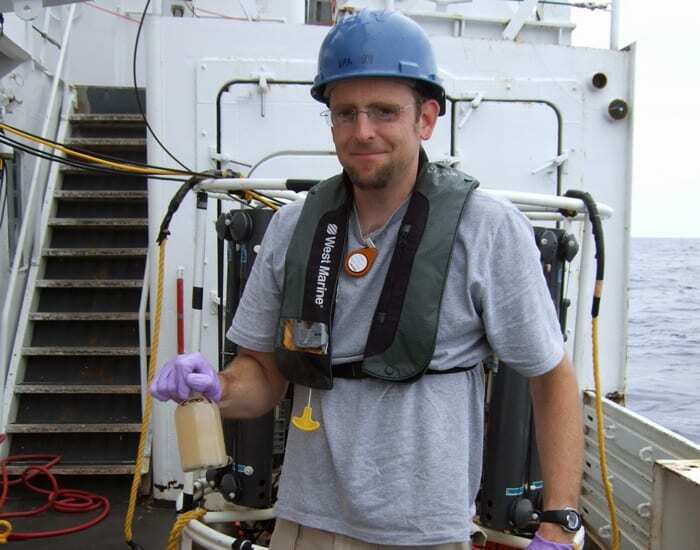 He initially planned to look for microbial respiration in the oil slick on the surface of the Gulf, but soon realized the cruise gave him the opportunity to expand his project. WHOI colleagues Rich Camilli, Chris Reddy, Dana Yoerger, and others were mapping and characterizing the petrochemical plume that was unfurling from the broken wellhead more than 1,000 meters below the surface. “Since I was along for the ride, I also began to collaborate with them on this work on the plume,” Van Mooy said. The initial measurements of depleted oxygen levels had been made with an oxygen-detecting microelectrode lowered into the water. It’s a high-tech method that has seen a lot of use in recent years, but Van Mooy thought the device might have been affected by the oil it encountered in the Gulf. Van Mooy replicated the earlier study by making some of his measurements with an oxygen microelectrode, but he also used another, very different, method to determine oxygen levels. The Winkler technique is about as far from cutting-edge as can be; it was developed in 1888 by a young Hungarian chemist as part of his doctoral studies. It involves bringing samples of water up to the ship and then engaging in procedures that will sound familiar to anyone who’s ever taken Chemistry 101. Despite its difficulty, the Winkler titration is the gold standard for measuring oxygen levels. It’s so reliable that one of its most common uses today is to verify readings made by other means, including microelectrodes. At the Deepwater Horizon site, it soon became apparent that the two methods were providing very different results. The microelectrode consistently showed substantially lower oxygen levels. That led to one of Van Mooy’s favorite moments of the cruise. As he and the other scientists were discussing whether oil contamination could be responsible for the discrepancy, WHOI research associate Cameron McIntyre Googled “oil and oxygen microelectrode.” Lo and behold, Sea-Bird Electronics, the company that made the microelectrode, had posted a warning about using the device in oily water: “Avoid fouling the oxygen membrane with oil or grease as this causes a calibration shift toward erroneously low readings,” it said. Even had they done that, Van Mooy said he still would have tested for oxygen with both methods. While the potential for oil contamination to affect the oxygen microelectrodes had already been established, the data he collected actually demonstrated that this probably happened at the Deepwater Horizon site. “Prudence trumps urgency,” Reddy said. “In this case there was an urgency factor, but I think that we answered the urgency factor by sending this memo almost as soon as we could to say, ‘Look, anybody who comes better Winkle.’” Government scientists heeded this advice, and since that time hundreds of Winkler measurements have been made in the Gulf. Van Mooy’s results, along with the map of the plume developed by his colleagues, were reported in October in the journal Science. He did find slightly depressed oxygen levels in one area of the plume, but nowhere near the drawdown reported earlier—and nowhere near being dangerous for marine life. “We couldn’t distinguish oxygen levels from what you might expect if you had just gone out there without an oil spill. So low oxygen wasn’t going to be a major event that would impact the fisheries in the Gulf,” he said. That was good news, of course, but it had a bad-news flipside: The oil wasn’t being degraded very fast. Van Mooy said that could have been because microbes had a hard time attacking chemical components from the spilled oil that remained in the plume, while more edible compounds found their way to the seafloor or to the surface. Van Mooy then turned his attention to oil on the surface. Much has been said about the unique challenges presented by a major spill at great depth, but in the case of the Deepwater Horizon disaster, the surface slick was also very unusual. Surface waters of the Gulf of Mexico, like those of the North Atlantic, are very low in nutrients, such as phosphorus, that microbes require to grow and reproduce. The only major oil spill that has occurred in a similar environment was the wreck of the tanker Prestige off the northern coast of Spain in 2002. Unlike Deepwater Horizon, that spill didn’t go on for weeks (“It was an event; this was like a continual faucet,” said Van Mooy.) And winds soon blew the slick closer to shore, where nutrient levels were higher. So scientists had never before had an opportunity to study what happens when massive amounts of oil are released into low-nutrient waters. Van Mooy expected that microbes wouldn’t eat much of the surface slick, because they lacked the other nutrients they would need to reproduce and convert all those extra calories into more microbes. He collected samples of water from inside and outside the slick and incubated them in the ship’s lab for 36 hours, measuring the rate of oxygen consumption periodically to find out whether microbes in the samples were eating the oil. He gave some samples a dose of phosphorus and other nutrients to see if that would prompt them to eat more oil. For this experiment, Van Mooy used yet another method of detecting oxygen levels. He glued an oxygen-sensitive sticker to the inside of each incubation bottle. The sticker fluoresced when he shone a laser on it. The wavelength of light it gave off indicated how much oxygen was present. Van Mooy did not invent the technique, which is a few years old, but he is among the first to use it with oceanographic samples. The method works in oily water and is quicker and easier than Winklers. It also allowed him to take multiple readings over time from a single sample. Winklers destroy the samples, meaning a researcher has to have many more in hand to start with. The results were clear—and unexpected. In water from outside the slick, respiration rates were normal (that is, moderately low). In water from within the slick, respiration rates were about 10 times higher. The microbes were consuming oil at a very fast rate. 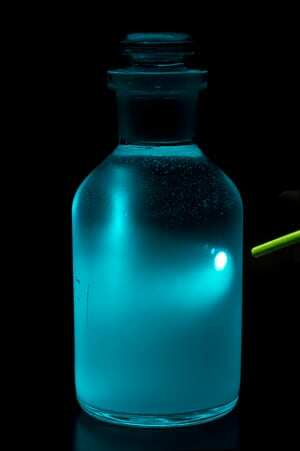 But they also lacked nutrients: Adding extra nutrients to the bottles boosted microbial respiration even more. Van Mooy was surprised that the microbes were able to respire so much oil, but the strangest result of the project came when Van Mooy brought frozen samples of slick and non-slick water back to Woods Hole. Joint Program student Bethanie Edwards [see sidebar below] analyzed lipids, the oily compounds that organisms use to make their cell membranes. Edwards found that lipids from microbes did not increase, indicating that microbial populations didn’t grow over the course of the experiment. How could the microbes be eating so much but not multiplying? Van Mooy thought maybe the microbes had reproduced, and their excess numbers were grazed down by tiny marine animals, or zooplankton. But Edwards also looked at the lipids of grazing organisms and found that their biomass didn’t go up, either. She suggested the microbes may have converted the oil into some kind of storage molecule, which they could tap for energy later if nutrients became more abundant. Edwards recently started using an instrument called a flow cytometer that counts microbial cells in the preserved samples, to verify her findings from the lipid analysis. If the lipid results hold up, further work will be needed to understand how the microbes were able to consume so much oil without reproducing. What are the longer-term impacts? In a paper Edwards, Van Mooy, Reddy, and Camilli are submitting to a peer-reviewed journal, they coined the term “futile respiration” to describe the situation where microbes utilized a big carbon source even though they lacked other necessary nutrients and couldn’t put those calories to immediate use. Van Mooy said he’s glad his hypothesis that the microbes would not eat the oil was wrong, because the microbes kept a lot of the oil from washing ashore. He stressed, though, that assuming that microbes will always clean up our messes is not a good way to think about future oil spills. When new MIT/WHOI Joint Program student Bethanie Edwards arrived at Woods Hole last summer, she walked right into the biggest science story of the year. 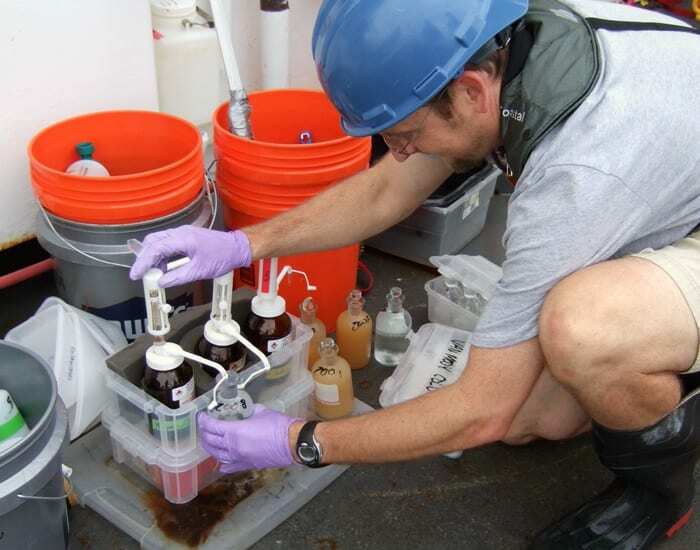 Her adviser, Ben Van Mooy, enlisted her to analyze microbial lipids in water samples he had collected from in and around the oil slick from the Deepwater Horizon spill in the Gulf of Mexico. She came to WHOI with a background in biochemistry and oceanography, and is interested in using chemicals as biomarkers—telltale compounds that reveal what kinds of organisms are present and what they’re doing. With the Gulf project done, Edwards will soon start studying chemicals that diatoms use for signaling and defense, and how those chemicals affect bacteria.